Setting up camp in the dark is hard, and it can be dangerous, too. 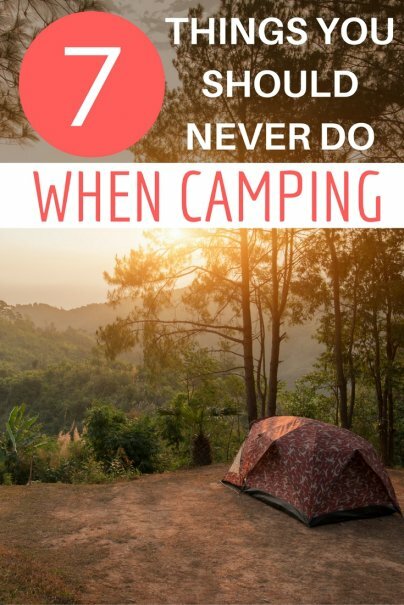 Even in the best-groomed campsites, there are often sticks, rocks, holes, or lumps of dirt, which can become tripping hazards when you run into them full-tilt carrying a tent pole. Sure, you have headlights and flashlights, which can help, but nothing tops arriving early in the day so you can assess your surroundings. In addition, arriving in the light means that you can find things like the all-important toilet. If something happens and you can't avoid a nighttime arrival, do your best to get as much light in the area as possible. Park facing your camping area and turn on your headlights. Tie flashlights to trees. Set a lantern up in the middle of your living area. Then, before you set up your tent, take your time clearing the area of debris and scouting out anything that might hurt you. Most camping is done in an area where you're not familiar with the landscape or, at least, less familiar than you are at home. Camping can also involve hazards that you aren't comfortable dealing with on your own and that you may not be able to anticipate. Because of this, it's always a good idea to take someone with you when you camp and not to go on outings alone. If you want to camp alone or you just need a time-out from your camping partners, be sure to tell someone where you're headed and about when you plan to return. If your friend knows you're out on a three-mile hike, they won't panic when you aren't back in an hour, but they will know that they should sound the alarm when three or four have passed. Critters love human food, and they will get into anything you leave out. Even small animals, like chipmunks and squirrels, can make a huge mess, and the food isn't very good for them, either. In some areas, you risk a run-in with something less desirable, like a bear or a skunk. And don't store food in your tent, either, because you certainly don't want animals in there! Usually, it is fine to put dry food in your car and to close and latch your cooler. In some areas, where bears are known to roam, you will need to make your food even more secure. Find out ahead of time what is required and make sure you have the supplies and know-how to do that. When it comes to the weather, something unexpected is almost bound to happen while you're camping, and it's best to be prepared with the right clothing. Since most camping happens during warm months, people tend to forget warm clothes. It's easy to ignore the fact that nights are almost always cooler than days, and that rain storms or cold winds can happen without warning. And, sometimes, you will want long pants and long sleeves for different reasons, like to keep bugs from biting or to keep the sun off you. If you're heading to a mountainous or high desert area, it's even more important that you bring warm clothes. Nighttime temperatures in both of these climates are significantly colder than daytime ones, and you could end up miserable and ill without the right clothing. When you're camping, the people at the site next door can become your helpers, your new best friends... or the people who wouldn't help you for the world because you annoyed them so much. If you don't want to find yourself in deep water with the neighbors, follow your common sense. Don't get drunk, make lots of noise in the middle of the night, play loud music, drive too fast in camp, or leave your fire burning when you aren't there. If you've done something annoying, it pays to apologize. And if you apologize with some freshly-baked camp cookies, it's even better. When you acknowledge that you did something annoying, people are likely to forgive... as long as it doesn't happen again. I don't care how experienced you are. Each tent goes up a little differently, and it pays to know exactly how the one you brought works. The same goes for any other gear: your stove, your hydration pack, your nifty new camp-cooking appliance. Take it out of the box and figure it out before you leave. Otherwise, you waste valuable camping time and try your own patience, not to mention that of the people camping with you. If you don't have a chance to put up your tent at least once before you leave, make sure you have plenty of light and plenty of time once you arrive at your destination. Send the kids to explore and let your spouse do something else while you figure it out. You'll all be happier with each other and better able to enjoy the rest of your stay. I get it. Your campsite has a bathroom — a real bathroom, with running water and paper towels and maybe even a shower. I don't care. Bring your toilet paper. You never know when a campground bathroom will run out of TP in the middle of the night, or when you'll be out by the lake or on a hike and find yourself in need. In these cases, it's so much less awkward to have the supplies you need. Sure, you have to trek it along in the first place, but it will save you a headache in the end. What do you enjoy most about camping? And what would you never, ever do?